"Weel she seemed alrecht", Carrot first thought upon hearing Derpy's rather enthusiastic response, "but whit is she sayin'?" At first Carrot thought about her having a concussion again but remembered Bolt's advice about Derpy speaking in her own coded language of sorts. That one's best bet was to *read* her reactions to yes or no questions as the most "effective" way to communicate with her. Carrot sighed, "Weel..haur goes naethin'". Looking at her eye to eye and trying not to blush, as he always does in front of cute fillies, no matter the situation. He also wanted to be careful not to accidentally insult her by giving the impression she was difficult to look at, what with her eyes seeming to look in opposite directions. Carrot asked cautiously, "Weel, Derpy ... um ... can ye help me, uh, us, tae gie tae th' post office?" Bolt had quite a hard time not giggling as Carrot tried to talk to Derpy, she didn't laugh but a goofy smile did spread across her face and she tried to cover it up with her hoof. It's not that Bolt was trying to be mean in having Carrot speak to her, but everypony has to learn sooner or later if they live in Ponyville. She decided not to add anything to the question that Carrot just posed to Derpy because if it got too complicated the conversation wouldn't go anywhere. So instead Bolt just stood next to Carrot and waited for Derpy to respond. Derpy put a hoof to her forehead and shook her head. "'round and 'round and 'round she goes! Where she stops, nobody knows!" she shrugged, reaching into her bag and grabbing out several letters, which she shoved into the mailbox that she had run into. "The crow flies at midnight!" she repeated the phrase from earlier. "I have miles to go before I sleep! Mike Costa thinks so!" she smiled at Carrot Fields. "I can show you the world after the miles!" She patted Carrot Fields on the shoulder and flew off again, delivering more mail to the ponies of Ponyville. Carrot stood there rather bewildered at Derpy's response at first. He hoped she was most likely understanding him and indeed answering his question, but he had the most difficult time deciphering what she was saying. "Ah thooght Ah was stoaner tae understand", as he backed up a little, bumping into Bolt on accident, "Sorry, Ah didne see ye thaur" he blushed before he turned back to hear the gray mail pony's final reply. When Derpy finished her answer, smiled and flew off again, Carrot turned back to Bolt, "Ah hink mebbe Ah understuid th' tail end ay 'at", stating with a facade of confidence, "Ah hink she will help us gie tae th' post office when she is finished". He wasn't sure of that at all of course, but he wanted to at least give Bolt the impression that he understood as he smiled nervously at her. Everything seemed very calm today, after moving a portion of clouds set for this evening's light rain shower she was set for a nice and long nap before anything like that would go on. Well, she was until there was a sound of something she should all to readily be acustomed to by now. The sound of crashing and strings of nonsensical words. With a faint grumble she glanced down from mid flight, peering at the crowd bellow near the tree before she perked a brow ever so slightly as her keen eyesight caught out two familiar pegasi. She should've known from the get-go that Derpy was down there, but why was Bolt there? And who was the read headed stallion? In a moment, she tucked her wings to her side and bombed it down for the ground, front hooves brought together to increase her speed and waiting, waiting till the very last second till her wings opened up in the denser air and she swooped. Causing a gust to follow her actions and dishevel some nearby bushes as she landed by the group and peered at them all expectantly. Glancing over Derpy, she eye'd the grey pegasi over and then the tree, noticing it slightly askew before she raised a hoof to her forehead. Containing the frustration before she snapped her eyes to Bolt and the red headed stallion. "Ugh, do I even have to ASK what happened here?" Briefly looking to the bubble headed blonde, the multicolored mare arched a brow at Bolt once more. "Did she fly into a tree AGAIN?" Bolt loved to watch Dash land, it was always so cool. Although really pretty much everything Dash did was cool so I guess this wasn't different. Although she tried, Bolt couldn't help but giggle a little when Dash asked her question "well yeah, and that mailbox over there" she said pointing at the mailbox Derpy had smacked into. Out of the corner of her eye she could see Derpy cramming letters and what looked like a muffin into another mailbox along her route. Looking over at Carrot and then back to Dash she spoke again "This is Carrot, he's trying to find the post office and he didn't realize Derpy was ... well... interesting? when he tried talking to her. I'd show him the way myself but I'm a little fuzzy on the details"
Carrot looked up as heard the nearby bushes suddenly rustle in an otherwise clam, lazy afternoon. What he saw was yet another pegasus filly, this time with a light blue pelt and striking rainbow colored mane who just finished a graceful swoop of a landing in front of them. Carrot already felt a little flustered with two pretty filly pegasai talking to him, but how with the newcomer he felt a little overwhelmed. He tried his best not to look to blushed or flustered, lest they all notice. "Um..hi, yeah, derpy, she crashed intae th' cabre an' mailbox loch bolt haur said". Realizing he was just repeating himself, he rubbed the back of his head with his front hoof, looking down and away, "Sae anyway, umm, anyway Ah hink derpy mention she kent waur th' post office was, but she seems bonnie busy an' Ah hae thes package an'..weel, dae ye ken whaur it is, umm.. aam sorry Ah didne catch yer nam." Glancing at the pair of ponies, Dash had to arch a brow at Bolt as she introduced this 'Carrot' figure and soon her deep magenta eyes fell on the akwardly fidgetive and shy looking stallion who was sort of fumbling over his words a bit...if they were words. The pegasus had to stare a little, mouth hanging open just a tad as she tried to make heads or tails of what this guy was trying to say, she sort of heard him...but at the same time...it was hard to tell if she was really hearing what she thought she was hearing. She certainly got the name portion of the sentances and the Derpy parts hitting into....whatever a cabre was. Must've meant tree or something. This guy's brogue was really heard to understand on the whole. Approaching the earth pony she held out a hoof. "Uh, Rainbow Dash..." She said, relieving herself of the showmanship she usually put into her introductions as she was more concerned what was going to go on with that grey pegasus acting up as usual. What did that other pony say? About the post office? Turning back to Carrot as she peeled her eyes off Derpy, she blew some of her multicolored mane out of the way of her eyes. "The post office? That's like...several streets away, yer way off course, Carrot." Carrot Fields was a little concerned. Ã‚Â The new pegasus filly with the rainbow mane was staring at him with a look of confusion on her face - sort of how he was looking at Derpy, he realized. Ã‚Â Why did he always stammer so much when he tried to make a good first impression with the fillies? When the rainbow maned filly offered her hoof, he hesitated briefly in his shyness. Ã‚Â Briefly he considered kissing her hoof, but no, that was too goofy... and then he realized that he'd hesitated too long, and they must be wondering why he was sitting there like an idiot. Ã‚Â Quickly, he grabbed her hoof and shook it vigorously, overcompensating for his hesitation. He felt both embarrassed and relieved when the filly, who called herself Dash, told him how far off course he really was. He rubbed the back of his head with a forehoof and gave a small laugh. Ã‚Â "Well, Oi'm new in town, so oi get lost a lot!" Ã‚Â He grinned, trying to turn it into a joke. Ã‚Â "So, umm, Oi dinnae suppose ye'd ken ta takin' me down that way, then? Ã‚Â Oi'd be more'n honored tae be shown th' way by any or all of ye bonnie fillies!" Ã‚Â Oh, giddae, that was laying it on a bit thick, would ye nae say, Carrot? Ã‚Â "Er, Oi mean, if'n ye could just hie me in th' right way, oi'd be much obliged." Bolt just barely managed to not giggle at how flustered poor Carrot was getting. She did however have a goofy smile on her face that she was desperately trying to hide behind a hoof. "Well I could show you around most of town, but like I've said before I think Dash and Derpy know how to get to the post office better than I do. Maybe we could start with the post office and then just give him the whole tour, Dashie?" Bolt smiled at Dash. It was obvious that Carrot got nervous around fillies and Dash being so bold was only making him more nervous, it was cute. ...The heck was this guy on about? Still holding out her hoof, she was about to pull it back before it was shaken with a rather big burst of energy, something she had to admire if it weren't for the fact she was mildly terrified of her arm being taken off. Jeez, this guy had a shake to rival AJ's. When he let go, she found her arm still shaking and stopped her limb before it decided to take off on its own. That would be the last thing she needed today and she watched both Bolt and Carrot in a moment of wariness. Show him to the post office? She got that part...so wait was she suddenly the tour guide now? Arching a brow she was about to protest before Bolt spoke up and those magenta eyes plinked at the pink pegasi every now and then. Dashie? Ugh. Grimacing in a faintly good natured manner, she turned her eyes back towards the earth pony and smirked. "Get ready for one hay of a tour, buddy." The chromatic filly said with a playful and blatant wink as she made her way leisurely in the direction of the town. "...It'd also help us keep an eye on Derps." Came the muttering afterwards. Carrot waited for the two pegasi to lead the way, following along on the ground, trying not to stare too much at the filly's tails as they floated through the air ahead of him. Ã‚Â Ah, how he wished he could stretch out a pair of wings and join them up there as well ... The town, he was there to get a tour of the town. Ã‚Â Not dream stupid dreams of wings and fillies. Dash had a good point, they did still need to keep an eye on Derpy. Maybe she was being a little extra weird today, it was always hard to tell. 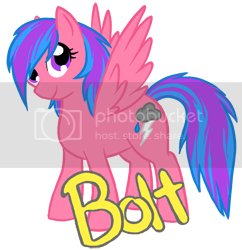 Bolt followed Dash as she flew ahead of Carrot to begin their tour, slowly flapping her wings just enough to stay off the ground. She turned her head back to Carrot and saw him lost a day dream, she smiled and slowed down to match his speed. Bolt couldn't really think of anything to say but she felt bad leaving Carrot behind the two of them so as she slowed down to match Carrot she landed. Folding her wings back in she moved closer and quietly walked next to him. Floating at a leisurely pace as her wings gently beat at the air, the pegasi's eyes briefly wandered of the two, Bolt first and then Carrot as he called her 'miss' and she couldn't help but let out a none to subtley hidden 'snrk' whilst she treaded the air she floated in. Miss? Jeez she was only ever called 'miss' at school or by people talking down to her certain peers who thought her work was...less than their standards demanded of her. Oh well. He was new, probably just being polite or something. Rolling onto her back in mid air, she rested her front hooves beneath her head whilst looking down at the red headed pony. A proud smirk on her face as her wings fluttered gently against the breeze. Carrot Fields rolled his eyes at himself, then chuckled softly along with Dash's smirk. OK, there was obviously such a thing as too polite - but it was a hard habit to shake off. He was glad she took it so good naturedly, and if it helped break the ice, then all the better! With that soft chuckle, a lot of the worry suddenly dissipated, and he just felt a sense of ease settle in. It helped that the Pegasus fillies who were guiding him were acting and flying so causal. His pondering about that was broken when he noticed Bolt, the other Pegasus guide, land and begin to walk right next to him. He smiled silently to the pink filly with the stunning blue and purple hair, proud of himself for acting so naturally, having no idea how pink his cheeks were. She was so cute, but he had no idea what to say in order to strike up a conversion. What would he say? Nice season for carrots? What's it like having wings? It all sounded so silly. Confound it, why was this so hard? He was just steeling himself up to say something random when Dash asked what he did for a living. Ã‚Â "Oh! Ã‚Â Oh umm.. Well, Oi'm a carrot farmer. Ã‚Â Oi ken th' borin' ol' carrots dinnae sound so interestin', but Oi enjoy it well 'nuff. Ã‚Â Been farmers fer generations. Ã‚Â Oi live out jus' past Sweet Apple Acres. Ã‚Â Y'ever go there? Ã‚Â Th' big orchard?" Ã‚Â He smiled with a another awkward, goofy lil' grin, his eyes moving back and forth between the two fillies. Ã‚Â "Though, ah ... what Oi really kin tae is stargazin' wit' my telescope at night! Ã‚Â Oi wish Oi could get up above th' clouds like ye do, full bhoona stargazin' wit' no worries bout weather ... they'd be so close! Ã‚Â Ach, aye, that'd be so bonnie!" Ã‚Â He blushed and ducked his head as he realized he was almost talking a bit loud and a bit fast with his enthusiasm. Bolt thought Carrot was so cute but he was so shy she was afraid to scare him! It seemed like every time she giggled or said too much he got nervous. So when Carrot's cheeks turned bright pink after she landed, Bolt tried not to giggle and just smiled instead. She looked at him with her big purple eyes while he spoke "Oh! I think I've flown over your farm before, all the farm land out there is a great place to practice flying fast because there's not much to get in your way"
He started talking about stars and Bolt wasn't sure what to do, she usually didn't like talking about her boring hobbies like reading or sitting on clouds and watching stars. With Dash there she'd probably look like a nerd if she admitted she liked watching stars too, but right now she didn't care enough about that. "I love watching stars! although I don't really know about astronomy. They don't look that much closer up in the sky, the only advantage is you get to sit up on a comfy cloud and watch. We're also a little restrained by the weather, even though we can fly, it's not very pleasant trying to relax on a storm cloud..."
Perking a brow ever so slightly, she watched the pair converse before rolling slowly so she was upright and briefly landed her hooves on terra firma before taking off again, this time floating a good three feet in the air whilst she stared back forward. Wondering what he'd like to see first. If anything. There were some shops, but they didn't look too interesting at all. She briefly commented on a few as she passed but nothing much else, 'this is blahblah' and 'here is such and such' with the name and purpose of the store were substituted for the latter. When he mentioned it was out past Sweet Apple, Dash blinked and rubbed her chin briefly in thought. "I think I might'a seen your place whilst rearanging some clouds..."
Carrot Fields smiled, even if he felt a little embarrassed that while they knew of his place, he couldn't ever remember seeing them. In fact, he never saw Pegasi over his farm unless they were setting up rainclouds, and even then they were so high up that he couldn't make out anypony individually. "Well, both ye lasses are welcome tae vist any time ye're hungry an' hie tae a break from yer weather makin'!" He blushed a little and ducked his head, but looked upwards hopefully. He glanced up towards Rainbow Dash, frowning. She seemed awfully bored, even while she was being so nice as to show him the way. "So," he asked, hesitantly, "Are ye th' same Dash wot won th' Young Flyer competition? Oi ken was a mighty fine rainbow streakin' past." He pawed his front hoof nervously at the ground as he asked - most earth ponies didn't bother keeping up with the Flying competitions, and they usually looked at him funny if he brought it up. "Wish Oi coulda been there ... heard it was th' finest in years." Inside his mind, he sighed deeply.. He can do this. Carrot glanced over to Bolt, and gave her a lil' shy grin. "Well, Oi kin offer ... that is ... Oi've a telescope, if'n ye've a kin tae seein' th' stars up closer... an' ye kin clear th' clouds if'n ye've a few in th' way. An' Oi kin always tell ye which stars are which, an' constellations, an' the like. Oi mean... if'n ye'd be interested..." He ducked his head again, his heard thudding nervously in his chest. Nopony noticed as the trio moved away that Derpy seemingly wandered off. Sure, the mail would be delivered on time. But Derpy forgot all about helping Carrot Fields, in her feather-brained way. Now she'd completely disappeared, perhaps hiding out in a tree somewhere, or maybe hanging out a top a cloud, as Pegasi do. Wherever she was, whatever she was doing, one could bet that she was having a derptastic time. And even if she did forget a lot of things, she never forgot what mail went to which houses. So it was that Derpy flew away, leaving Bolt and Rainbow Dash to show Carrot Fields the way to the Ponyville Post Office. Wow an earth pony who kept up on flying competitions, that was so cool. Most earth ponies couldn't be bothered with stuff like the weather or flying, her favorite things. Carrot was definitely an interesting stallion, between the accent, liking cool pegasus stuff AND knowing about the stars. He seemed like he was getting a little less shy, maybe if she just kept being a little quieter than she usually was he'd open up some more. When Carrot was done talking to Dash about her flying competition he turned to Bolt and... offered to teach her about the stars?! That sounded so awesome! She tried not to get too enthusiastic because it seemed to make him more nervous (and made her sound like a total dork). "Wow really? that sounds so great! I could totally move a few clouds around to give us a better view. You know all the real names for the constellations? I usually just make up my own... " She trailed off because she thought she was starting to sound like a total dork, so she just gave a shy smile to Carrot as they kept walking. Rainbow's ego perked its huge head up when her accomplishment at the young flyer's was mentioned, a smile split from ear to ear as she was practically cantering in mid air with a showgirl flair whilst she spoke. Wings fluttering away happily at their owners own joy that bubbled happily in the pit of her stomache. To be mentioned, to be spoken of as a legend, it made the boastful pony so cheerful to know she'd done well and had done well by doing exactly what she loved. Flying. "Well!" She started, bringing a hoof to her chest with that grin still in place. "From a pegasus like myself, y'just can't expect nothing BUT the finest!" Okay that may have been a bit too much. She won out of luck, if she hadn't hit the barrier, Rarity and the 'bolts would've been...well...it didn't matter. She HAD gone fast enough. And she HAD gotten to them in time and THAT is what mattered. Still fluttering infront of the pair, she listened to their conversation and briefly glanced upwards. Yeah, stars were nice, not that interesting though...just...staying there. Motionless. Doing nothing for the majority of the time. Now SHOOTING STARS. -THEY- were awesome! She'd always wanted to race a shooting star, it was on her list of awesome things she wanted to do in her life. Carrot watched as Dash flew in a very casual manner, but with a sudden new aura of pride and confidence, after he mentioned the Young Flyers competition to her. She seemed particularly proud of her accomplishment, even if he still wasn't sure if the legend was true. Did she really do the famous "Sonic Rainboom?" Normally, Earth Ponies don't talk much about the pegasus competitions, but even among the farmer ponies back home, the Rainboom was a legend brought up from time to time when the local farmers gathered about to drink and exchange stories, and point up at a rainbow shining in the sky after an afternoon shower. "Oi heared th' tale that ye won through a Sonic Rainboom! Aye it fact? Didje do 'er first time in th' contest? 'ow 'ard was it?" For Carrot, who always wanted to fly, it seemed amazing any pony could pull off such an amazing, magical feat. .
Of course the lovely pink pegasus filly walking next to him was stunning in her own way. Incredibly friendly and amazingly cute, she probably was noticed by all the pegasus colts all the time. What was more incredible was that she actually liked star gazing! Why had he done that?! Why did he go ask some stunning filly out, in front of her friend, no less! Oh, this would never end well ... ah well, he was used to reject- W ... wait on a mo? His ears perked up, and a big goofy grin spread across his face. She said ... she said YES! He couldn't stop a joyfull lil' hop from entering his step. Carrot had to hold his emotions inside, to not do anything obvious or silly like ... like yell out "yippie!" or rearing up while neighing proudly. Instead he just grinned, and blushed, and grinned some more. "Oi'd shine tae showin' ye th' constellations! Oi'm sure ye must ken tae some good high, dark places where we'd see full bhoona!" He had his own proud skip to his gait, almost mirroring the proud strut of the pegasus above him, when she asked if he knew the constellations, "Aye! Oi ken each 'n ever' one by name an' by sight!" That fact made him proud for a moment, but then he realized it may also make him look dorky, or worse, arrogant for stating that fact with such gusto. He ducked his head a bit more, his face matching his mane for a bit. "So, umm, ye said ye came up with yer own names for them? That's right-on creative! Maybe ye kin teach me yer names, too, when we hie out tae see them!" Bolt couldn't help but giggle when Carrot got all excited about the two of them going stargazing. She was pretty excited about it herself, she wanted to get to know him better and this seemed like a really fun way to hang out and talk. "Wow you know all of the real names? you must study a lot!" She was starting to feel silly because it sounded like he spent a lot of time studying astronomy and she didn't know much about it. She just thought stars were pretty, and although she's wanted to learn she never knew where to start. "Oh well... yeah I make up names for them but they're just silly, I'm sure the real ones are much nicer" her cheeks were bright red. Rainbow Dash really tried to keep her attention on the question Carrot posed to her which almost made her mentally scoff. Was it hard? Ohohoho...well yes it was. But honestly she had done it before, fluke or not. And it was a magnificent moment in her life which she replayed again and again in her head, the air bursting around her, the light bouncing off her body as she broke the barrier and the explosion of color that followed. It was a moment of pure exhiliration and adrenaline. Something she'd be telling her grandfoals about one day, if she had any someday, s'all good. However watching those two out of her peripheral vision made her feel a little like horking it up, ugh, so sweet and cutesy. She grimaced to herself before rolling slowly so she floated upside down for a brief moment or two, ugh this was so akward to do. Even if the Poison Joke had did it to her, doing it when everything was alright made her stomache want to inverse. "Should I leave you two love birds alone~?" The colorful pony teased in an almost musical tone of voice before twirling back to a less vomit enducing position. Carrot Fields gave a shy smile, listening to Bolt's questions, still finding it hard to believe that a filly this pretty could be interested in astronomy like he was. Ã‚Â Sure, it was one of his passions, perhaps the greatest one, but no one else ever shared his interest - at the most, they just smiled politely and nodded when he excitedly enthused over stars, constellations, and so on. Ã‚Â Bolt, though, seemed genuinely interested. Ã‚Â A nagging bit of doubt whispered in the back of his mind, Don't be stupid, she's not really interested, she's just trying to be polite. Ã‚Â He steeled himself and yelled back, still only in the silence of his mind, No! Not this time! Ã‚Â I'm not letting you sabotage this! Ã‚Â He would be respectful, he'd take her at his word, he'd give this a chance! All this took only a few moments, and he looked up with a nervous grin on his face, a shaky confidence swelling through him. Ã‚Â "Oi've been reading up on th' night sky e'er since oi was a wee bairn! Ã‚Â E'er since 'at first day Oi got tae get up high, an' see th' night sky full bhoona, from horizon tae horizon! Ã‚Â Me kin got me a copy ah The Astronomical Astronomer's Almanac of All Things Astronomy, an' Oi was quite a happy foal!" Carrot's ears were perked up with his excitement, and his shaky confidence was growing stronger as he talked, and watched the happy smile and genuine interest on Bolt's face. Ã‚Â "Oi don't care if they're silly. Ã‚Â Oi ken a buncha th' real names're silly. Ã‚Â Just came about cause some colt or filly was sittin' on a hill an' said, "Oye! Ã‚Â Dinnae that look loik a boat?" er some such. Ã‚Â Oi'd love tae hear yer creative names, silly as they moight be, an' yer story story fer each one." Ã‚Â He really was looking forward to it, too - spending the night out with a cute filly - true, he'd just met her, but ... there was just something about her that started to make him feel more at ease, more relaxed around her than around most other fillies. At Dash's comment, though, all that nervousness came rushing back. Ã‚Â Lovebirds?! Ã‚Â Oh, geez... he'd been presuming too much, hadn't he? Ã‚Â Not that he'd actually expected anything to happen, but ... oh, how embarrassing! Ã‚Â And what if that made Bolt embarrassed, too? Ã‚Â Sure, she was cute, and plus she liked stars, which just made her all the cuter! Ã‚Â But ... Argh! Ã‚Â Why'd she have tae say that? Ã‚Â Did Oi do sommat wrong? ... ... ... Does she know something about what Bolt feels that I don't? Ã‚Â The unexpected positive thought just caused Carrot to flush harder, ducking his head to hide the little nervous, goofy grin that was spread across his face. Fortunately, they were at the post office! Ã‚Â He'd almost forgotten about it! Ã‚Â "Aye, 'ere we are! Ã‚Â Thankee sae much, Dash!" Ã‚Â he exclaimed with a little too much excitement, wanting to somehow lessen the impact of Dash's previous question and change the subject. Ã‚Â Well at least now he knew where it was at, although it didn't seem all that important anymore. Ã‚Â His mind was on other things now, especially ... oh, he forgot to ask her what night would be good for her! Ã‚Â He was almost scared to ask, after Dash's teasing. Carrot nervously looked up at Dash, then to Bolt, "Thankee both of ye lasses, fer helpin' me get here! Ã‚Â Was right kind of ye!" Ã‚Â He pawed at the ground with one forehoof. Ã‚Â "So ... umm ... were ye wantin' tae see th' stars taemorrae noit? Ã‚Â Oi know there's a great hill just o'er that way.." he gestured to one direction with a forehoof. Ã‚Â "There were a good bunch a' ponies watchin' th' meteor shower a couple weeks by!"